The 3style scooter is a recent addition to the scooter market. It's features and low price point certainly gives the mini micro some competition. 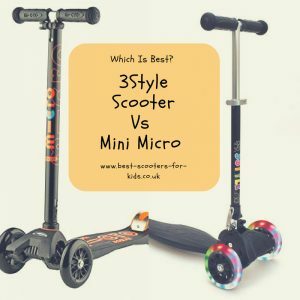 So does the 3style scooter really compare in terms of features and quality? To make matters more complicated Mini Micro have 2 versions of their scooter to choose from. The mini micro classic and the new mini micro deluxe. To help you decide check out a comparison of their features below. The lighter the scooter the better for younger children. The reason for this is that young children benefit from a lighter scooter. It’is easier for them to control, to lift up pavements and kerbs, to navigate over steps and through doorways. Quite often when young children learn to scoot, they will stop the scooter and try and pick it up to change directions.So how do the 3 scooters compare in terms of weight? The mini micro classic has been specifically designed to be as light as possible. This will make it easier to learn the lean and steer style of learning to scoot. Children will be able to manoeuvre this scooter with ease. Being light is so important to the makers of the mini micro classic they have foregone folding mechanisms and adjustable handlebars to make their scooter as light as possible.The mini micro deluxe is the next heaviest. The adjustable handlebar on this scooter means that you will be able to get the perfect height of handlebar for your child. But it does add a bit of extra weight to the scooter. The 3style scooter is heavier due to the folding mechanism as well as an adjustable handlebar. So you have the extra features but also the extra weight that goes with it. As a child gets older, heavier and stronger they will be able to manage a heavier scooter with ease. Which one you choose will very much depend on how old, heavy and strong your child is. I loved having a foldable scooter for my eldest son when he was little. It was so easy to put on top of a buggy when he had enough scooting and just carry along. It’s also easy to store and transport in a car. The mini micro scooters aren't foldable. A folding mechanism adds weight to the scooter. In their quest to make the scooter as lightweight as possible, they have not added the ability to fold it. However, the handle can be removed from the base if you want to take it on holiday or store it compactly. Both the mini micros are very much designed for the 3 to 5 age group (or 18 months to 5 if you buy the version with the tbar). I got my youngest son’s mini micro classic when he was 2 ½ and it’s still going strong and we are now heading towards his 5th birthday. It’s perfect for the 3 to 5 age group due to it’s lightweight design and other features. Mini Micro Classic - The 66cm handlebar on the mini micro classic should pretty well accommodate most children between these years. How long it lasts for you may depend on how quickly your child grows too. It's recommended for children between 3ft – 3ft, 7in (98 – 110cm) in height. Mini Micro Deluxe - the handlebar adjust from 48cm to 68cm. This means you can put it for the perfect height for any child. It also makes it a very good option for the smallest and youngest of children as the minimum height is 48cm which is the lowest of all three scooters. 3Style Scooter - The 3style scooter should last children for longer due to it’s adjustable handlebar. It adjusts from 52cm to 78cm. This should accommodate children younger than 3 up until at least 5 or 6. ​ It is better for older and taller children as the handlebar height as the highest maximum height. The 3 style scooter is the cheapest scooter being sold at around £39.99. The mini micro classic is normally priced around £64.99 and the mini micro deluxe at £79.95. One thing that sets the mini micros apart is that it’s been tried and tested for many years already. The company always sets out to remind customers of “its exceptional Swiss construction, uncompromising quality and innovative design.” And it’s hard to argue with that with the years of reviews and repeat customers. You know that the brake isn’t going to fall off because it’s too flimsy.In fact if you look at the mini micro website you can see that every part of the scooter has been designed and made with quality in mind. For example, the mini micro features a flexible fibreglass reinforced footplate to absorb bumps in the pavement. The brake is designed so even the slightest pressure put on it will bring the scooter to a gentle halt helping safety be at the forefront of the design.Having owned a mini micro scooter myself I can vouch for their quality. My son’s has been going strong for nearly 2 ½ years now and it has stood up to some abuse. The answer to this question will depend on your budget, age and needs of your child. The Mini Micro Deluxe is an excellent choice for toddlers and smaller children. This is because the adjustable handlebar will go down very low. Ideally kids should have the handlebar around waist height as this makes it easier for them to control. A handlebar which is too high will be a lot more difficult to manage. The adjustable handlebar and light weight means it's actually a good choice for all 2 and 3 year olds as you can make sure it's the right height for them. If your budget is lower the Mini Micro Classic is a good choice for kids around 3 years of age and around average height.The 66cm handlebar should be a good standard height for them and will last for a couple of years. It's super lightweight which is always a bonus for young children when learning to ride. It looks good, is durable and guaranteed high quality. The 3style scooter is a great option if you are on a budget.It's also a good choice if your child is a tall 3 or 4 year old as they handlebar can adjust all the way up to 78cm which will give extra growing room. ​Taller, heavier children will also be able to manage a scooter which is a bit heavier as well. ​The lowest handlebar height is 52cm which means that it will accommodate small children as well. Ideally the handlebar height should be around waist height for easier control.